We've all heard horror stories about it, and we all dread it. I'm talking about fine print. Many of us fail to read it, or even give it a cursory glance before we sign, or agree to something. I'll tell a story of how fine print can trip a person up, and end up costing them more than they expected. A little over a year ago, my husband opened a credit account with Bank of America. He received the card in the mail, activated it, and began to use it. I advised him to read the terms and conditions carefully, but with the bravado that's so typical of him, he said that "he didn't have time for fine print". I shrugged, and went about my business, hoping that he wouldn't go too crazy with the credit card, and that we'd be able to pay the balance each month. We managed to pay the balance for about six months, then he bit off more than he could chew by requesting a cash advance on the card. He found an incredible deal on a classic car that needed restoring, and the owner wanted $2500 for the vehicle. He got the cash, but not before I again told him that he should review the terms on the credit card agreement that referred to the interest rate charged on cash advances (If I recall correctly, the rate was 32%. Steep!). He was in such a rush to get the car that technicalities like that weren't important to him. They soon would become important, however. The next month we couldn't afford to pay the entire balance, of course. The total owed on the card was $3,100, and after we paid all the necessary bills like rent, car insurance, water, phone, and utilities, we could barely manage to pay the minimum of $150. As times got rougher, we couldn't even bear to pay the minimum. After about five more months of not paying at all, the account went into default and collection efforts were started. My husband received several "courtesy notices" reminding him of the money he owed, and he foolishly continued to disregard them. Then, the efforts got decidedly less friendly. My husband checked his online banking statement one morning, and he was more than $1,000 overdrawn. He'd written five other checks the week previously, but they didn't add up to what he'd had in the account, which was almost $4,000. Here's a breakdown of what the bounced checks were supposed to pay for. Car insurance. He lost coverage that month, and had to borrow money from his parents to get it reinstated.-The phone bill. Our house was without phone and internet service for a week, until he was able to pay the bill, plus the returned check fee, in cash. Our electricity bill. Luckily I was able to call and get an extension, to avoid having the lights cut off. The water bill. As with the electric company, I was able to negotiate a payment arrangement to avoid losing the water service. The trash collection bill. As that was the smallest bill of the lot, my husband was able to go to the hauling company's local office and pay in cash. He called the customer service number for Bank of America, and after waiting ten minutes to speak to a representative, he found out why the account was so seriously in the red. 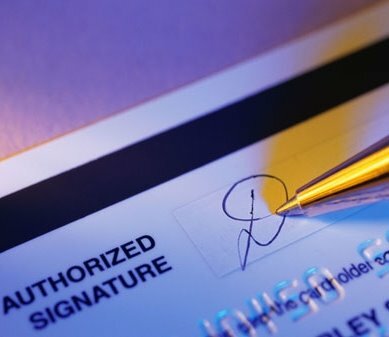 Since he hadn't read the fine print on the credit card agreement, he hadn't known that his Bank of America card was linked to his Bank of America checking account- and that after the account went into default, the credit card company could go in and drain his bank account to pay the bill. He was angry and shocked, but it was really his mistake because he didn't bother to read the terms and conditions that went with the card. After alternately pleading, feigning ignorance, and arguing with the Bank of America credit card customer service rep, he finally negotiated a deal where he'd be partially reimbursed for the money taken out of his checking account. He ended up losing $2,500- the amount of the cash advance he'd gotten. He was still irritated about that, but as I quite rightly pointed out, losing $2,500 is a lot better than losing nearly $4,000. I told him to let that whole experience serve as a lesson and a warning, which, thankfully, he has. He's much more diligent now about reading the fine print on everything. Always, always read the terms and conditions on any credit card you're about to sign up for. The credit card companies LOVE it when people don't read the fine print, because that means they can slap them with all kinds of late fees, higher interest rates, and other miscellaneous charges. It may not be exactly fair, but it's perfectly legal. Sorry to hear about the situation. It is extremely important to read the terms and conditions of any program that you would like to join, because you agree to those terms. Why would one agree to something that one didn't even read?